Fast And Furious 8, Batman v Superman, and a million Marvel movies. Many people spend their summers watching films like these. But once upon a time, it wasn’t all about sequels, prequels and reboots. What’s changed and why? As the lackluster blockbuster summer (I’m looking at you, Suicide Squad) winds down, I reckon this is a good moment to reflect on how the film industry has become overpopulated by stuff we’ve mostly seen already in some shape or form. Though sequels have been a big part of the film industry for years, these days it seems that movie franchises are crucial to the filmmaking strategy at the big studios. In 1995 only five of the top 20 highest grossing films of that year were prequels, sequels or reboots. Last year that number shot up to 13! In his essay about movie franchises, film industry expert Mark Harris goes as far as to say: “Franchises are not a big part of the movie business. They are not the biggest part of the movie business. They are the movie business.” How has this happened?? Filmmaking is a risky business. As more and more studio executive positions are occupied by business people – rather than those with experience in actually making movies – it’s inevitable that moviemaking gets ruled by business logic. Movies have to bring in more than they cost. They need to make a profit. And so studio bosses do their best to tame the financial risk. One way to do that is to relentlessly cater to our demands. And what do we want? Well, we just love franchises and keep going in droves to the next instalment of Harry Lord Of The Avengers Meets The Second Batman. Familiarity with the source material lowers the risk, ensures an existing market for the film, and means profit is more likely. That’s why we get all the wacky wizards, grown men in tights, and Bonds, James Bonds. Another reason for all the franchises is the growing international market. For movies to do well overseas, they must be recognizable. They also need to cater to an audience of diverse cultural backgrounds. So, an action-packed comic-book movie with an internationally known lead is more marketable than a dialogue-heavy indie film exploring the meaning of life in rural Kansas. The biggest international market for Hollywood is China. In 2015, Fast And Furious 7 raked in $350m in the US, coming in at number five on the highest-grossing movies that year. But in China it earned $390m and was the top grossing movie. In short, the international movie market can’t be ignored, so Hollywood doesn’t and changes its production strategy to appeal to a global audience. Ah, remember the days we used to go to the rental store for some weekend movie magic at home? No? The studios do, and boy do they miss it. With all the Netflix-and-chilling, torrenting and downloading, studios are missing out on a large chunk of revenue these days. Revenues which used to finance more original movies, according to Lynda Obst, a Hollywood producer. Try to not be amazed while walking through the Wizarding World of Harry Potter in Orlando and you’ll fail miserably. The sheer immersion of the experience is unlike anything I could’ve ever imagined. Yes, that is a real owl. Yes, that is Butterbeer. Yes, those are the beautiful Veela from Beauxbatons. Unlike the studio tour in the UK, the Harry Potter theme park in Florida goes above and beyond to make you feel just like a Muggle visiting a magical world. But what struck me even more was all the little bits and bobs you can buy. Quills, broomsticks, wands, and remembralls. Walking around the park, seeing all the visitors in full Hogwarts regalia, I slowly realized the scale of this industry. So, we can think of a theme park as a big front for selling merchandise, another cash stream for the film studios that own the franchise brands. It’s not a coincidence that you exit all the rides through the gift shop, after all. As much as a third of the billion dollar industry that is the Harry Potter franchise comes from merchandise sales! And now Disney is building a Star Wars theme park too. Which is, to be honest, pretty awesome. 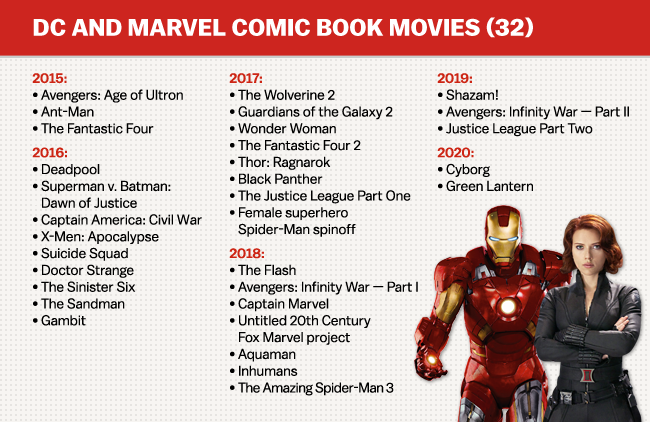 So, if you’re a fan of comic book movies and other big action-packed blockbusters, this is the golden age of film for you. Enjoy it while it lasts! If you’re frustrated by all the repetition, there's lots of great television being made at the moment. Lots of good original stuff happening there. I recommend The Knick or Transparent. Okay, that’s a wrap!